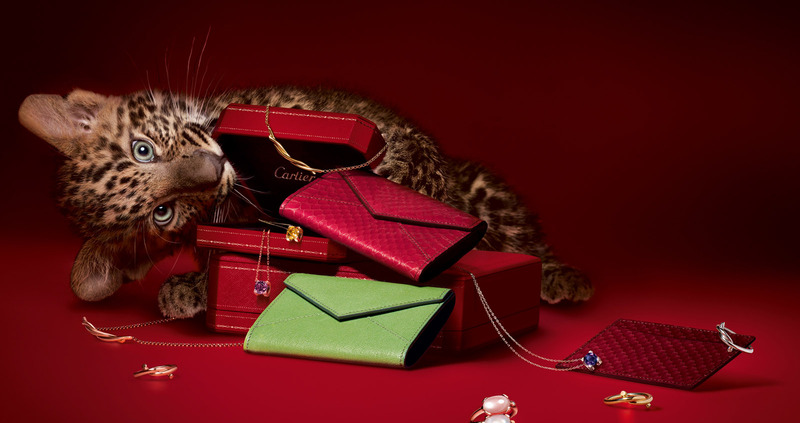 Crafted for an adventurous lifestyle, the women’s Cartier Pasha Seatimer Steel W3140002 captures carefree style while maintaining its class. Made with advanced technology, this watch is dedicated to providing accurate time. If you’re looking for a watch that gives a fairly detailed time reading without too many bells and whistles, this might be the best purchase for you. 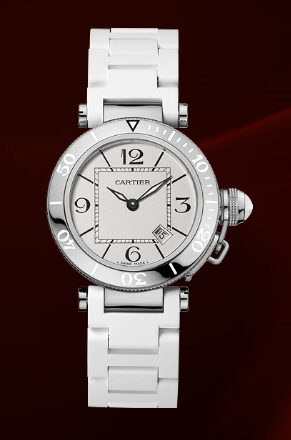 The Cartier Pasha Seatimer Steel W3140002 keeps time with quartz movement Cartier caliber 688. It is made with a lovely steel case and comes with an adjustable white rubber strap that has an easy-to-use steel deployment buckle. It has a fixed bezel that is engraved with white numbers that mark the time by tens, and minute markers in between. On the opaline dial face there are black numerals every quarter and hour line-marks in between. Between 4 o’clock and 5 o’clock there is a convenient calendar aperture window. Its steel, screw-down crown is decorated with white ceramic “Clou de Paris” motif and its dial window is made with durable, scratch-resistant sapphire crystal. A very useful feature of this watch is that its diamond-shaped black oxidized hands illuminate to give you visibility even in dimly lit places. This watch is highly functional, as it is water resistant up to 100 meters (330 feet), which protects your watch from splashes and shower water. 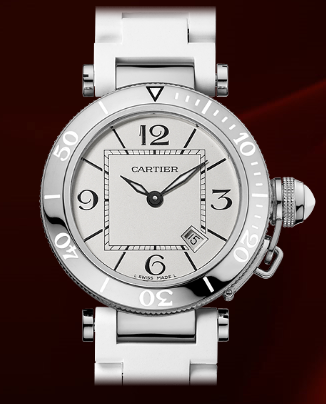 An up-close look at the Cartier Pasha Seatimer Steel W3140002 dial face. Perhaps one of the only downfalls of this watch is the dial design. Because there are two time-marker rings it is slightly confusing to quickly read the time. This, I assume, would take a little while to get accustomed to. The minute markers are counted in tens, rather than by the standard minute markers every five. And there are also only minute markers every minute from 12 o’clock to 4 o’clock, so getting a down-to-the-minute time reading past 4 o’clock might be slightly difficult. To put it simply, the Cartier Pasha Seatimer Steel W3140002 is a unique watch. It has many benefits of a luxury watch while keeping it simple without sub-dials. The watch itself is very sleek and gives a modern spin on a timeless classic. However, the dial face design is a bit cluttered and with some missing minute-markers, it can make telling the exact time a frustrating task.